Not sure how to use hostinger hosting account you have just created? Don’t worry, in this guide, we will go through the most important features and tools you can find on Hostinger members area. From domain name management to website creation – we will cover the most necessary topics. Let’s get started! At Hostinger we take yours and our business seriously. That is why we ask each client to provide valid details required for successful domain name registration and hosting setup. Don’t worry, it takes less than one minute. In order to finish hosting setup, access Home section and press Setup button next to hosting order. In the new window enter required details and hit Setup button. 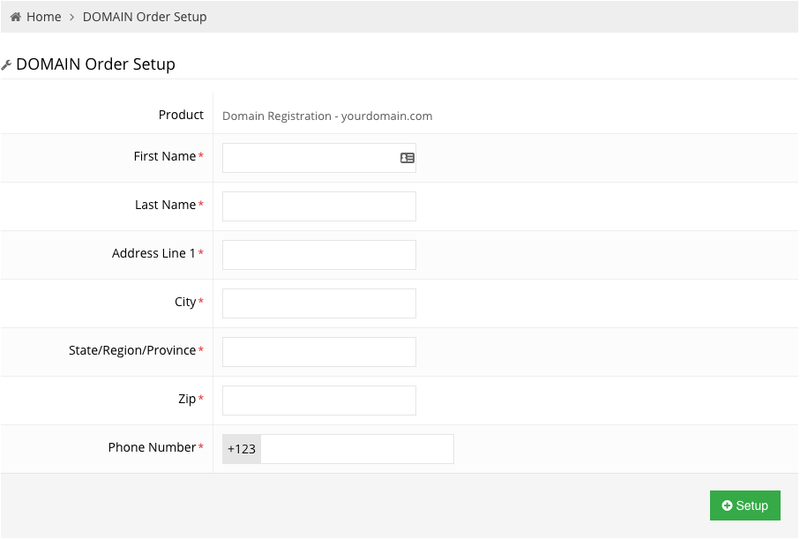 Just like hosting, domain name order can be completed by accessing Home section and pressing on Setup button next to domain name order. You will be redirected to Domain Order Setup page where you will be asked to fill in valid WHOIS details. To finish VPS setup order, open Home section and hit Setup button next to the pending VPS order. In the new window choose operating system, data center location and enter VPS hostname. Hit Setup button once you are ready. First of all, you need to login to Hostinger’s members area. Login link can be found in the welcome email message. Hostinger’s members area was built having user experience in mind. Therefore, it’s extremely easy to navigate and find all tools needed to configure the hosting account. Home – On this section you can see the latest messages, activity log and your active services. 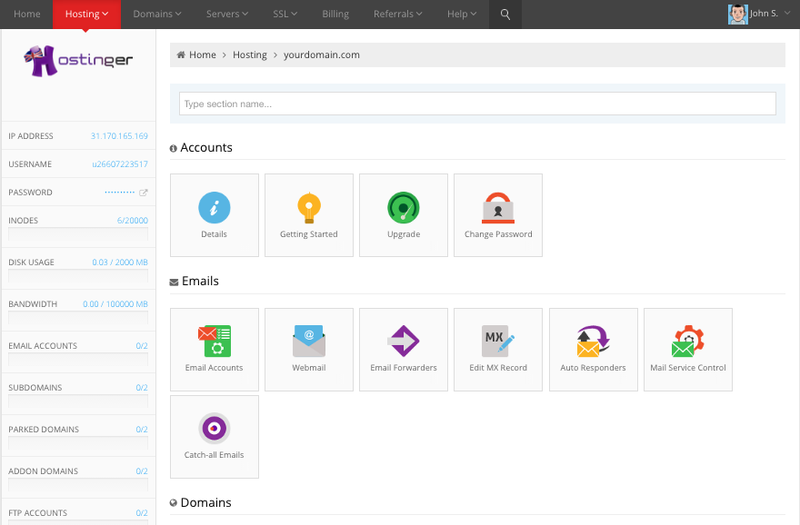 Hosting – Use this section to access and manage all your hosting accounts. A new hosting account can be ordered on this section. 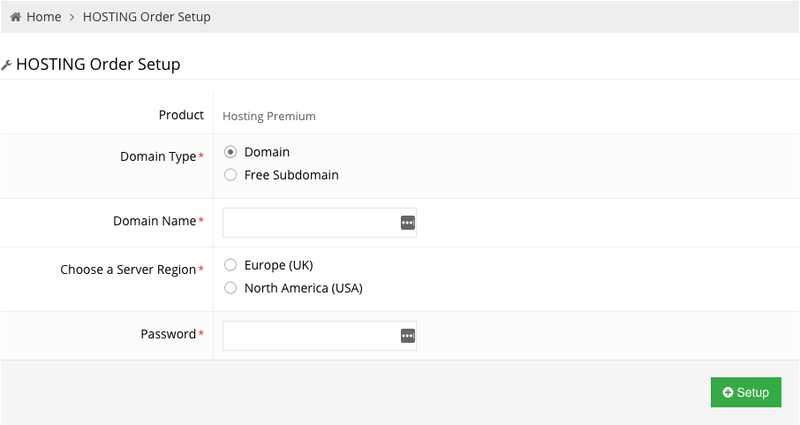 Domains – Used to manage all domains registered with Hostinger. You can also register a new domain name here or renew your existing one. Servers – Here you can order a new VPS (virtual private server) or manage your existing server. SSL – Everyone likes that green padlock near domain name! On this page you can order a new or manage your existing SSL certificate. Billing – We made billing and payments easy and understandable for everyone. Here you can find payment receipts and all the services you are paying for. Referrals – Refer your friends and earn money! On this page you can find detailed referral statistics and get everything you need to refer friends. Help – If you ever run into technical or billing issues, see latest Hostinger news, knowledge base or get help from Hostinger customer service. Over the time personal details you have entered during registration can become outdated. In order to prevent issues related to billing or account access, it’s necessary to keep them updated. On Profile section which can be accessed by pressing My Profile button you can update your personal details, change the password and add your social media accounts. We also implemented Activity log and Login History so you could easily track actions made on your account. To give others access to your amazing website, you need to have a working domain name. You can choose from 2 options here: use your own domain name registered somewhere else or register a domain name on Hostinger. If you already have a domain name, you need to point it to Hostinger nameservers. Nameservers can be found in Hosting -> Members Area -> Details section. Once you have pointed your domain name, allow 24 hours for DNS to fully propagate. You can also point the domain name via A record (IP address). The IP address of your account can be found on Hosting page. If you choose to register a new domain name during registration, you don’t have to change any DNS details – your domain name will be automatically pointed to Hostinger servers. At Hostinger we aim to register domains as soon as possible. Hostinger gives you full control of your domain name and DNS zone. In addition, you can create subdomains, parked and add-on domains and redirects. All this can be done on Hosting -> Members Area page. On Hostinger you can have a domain name specific email address without any additional cost. We also offer many premium features to fulfill all your email needs. Emails section can be found on Hosting -> Members Area page. 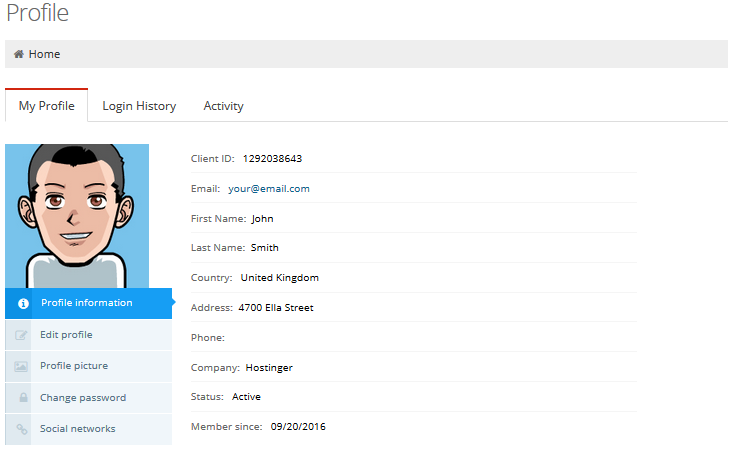 Email Accounts – create and manage existing email accounts. Here you can also find all required details to configure desktop email client. Webmail – RoundCube webmail client allows to read and send emails from any computer. Email Forwarders – this tool allows to forward emails from one email address to another. For example, using this tool you can forward all emails from info@yourdomain.com to tom@yourdomain.com . Edit MX record – useful if you want to send and manage an email account on a different hosting or service. Auto Responders – automatically reply to anyone who sends you an email. Mail Service Control – enable / disable various email services. Catch all Emails – creating a catch all email address can prevent loss of an important email message. It will automatically catch all emails sent to an incorrect, non-existent email address. Import Website – We built this tool to make website transfer as easy as possible. Simply select a .zip, .tar or .tar.gz archive of all your website files and it will be extracted directly to the public_html folder. File Manager – Using web based file manager you can upload and manage your website files. It’s fast and super easy to use. FTP Access – Hostinger supports File Transfer Protocol (FTP), therefore you can use an FTP client to upload your website files. You can find details necessary to connect to FTP in the welcome email message or FTP Access section. This powerful drag and drop website builder is perfect if you are not familiar with content management systems or coding. Just choose a preferred template and start filling your website with content. Using our custom built app installer it will take just a few minutes to install popular apps like WordPress, Joomla, Moodle, etc. Besides these options, you can code your own website and use already mentioned methods to upload files to the server. Everyone is welcome at Hostinger. Don’t worry if you’re still not sure how to use Hostinger. We offer 24/7 support and if you run into any kind of problem open a support ticket by clicking on Help -> Support button. Our dedicated customer service will do their best to answer all your questions.